Founded in 1867, Lakeville Lodge #353 has been a pillar of the Lakeville community for over 150 years. Many local streets and landmarks are named after some of its notable members. The current Lodge building is on Mangus Drive, named after the Honorable Richard W. Mangus, who was a 32 year veteran of the Indiana State Senate and 50 year member of Lakeville Lodge. Lakeville Lodge was founded during the post-Civil War reconstruction when Lakeville Masons grew tired of riding their horses and buggies 12 miles (that's two or three hours travel time) to South Bend Lodge #294. 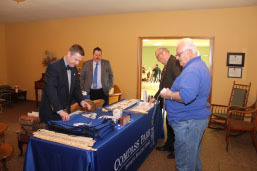 Dispension was granted by the Grand Lodge of Indiana and Lakeville Lodge began meeting in a room over the General Store and Hardware on Michigan Street in Lakeville. As a Masonic Lodge it is our goal to carry on the tradition of the fraternities in the community of Lakeville and let our light so shine that the world at large may see and be convinced of its good effects.